Calling all Zooites! Your chance to attend the second Zooniverse Project Workshop in Chicago! 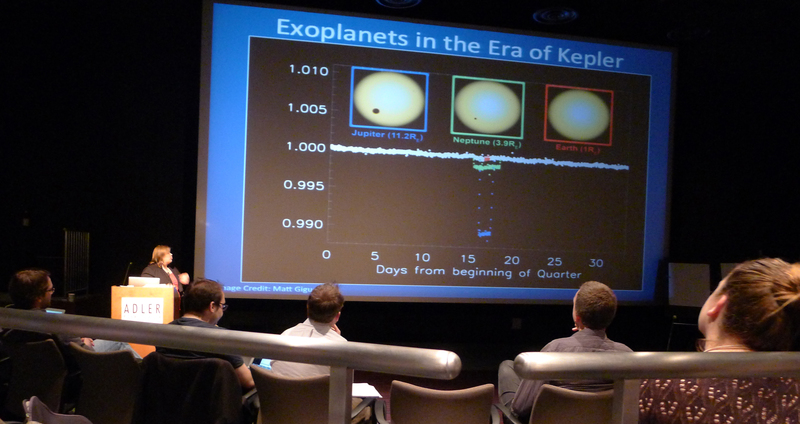 It’s almost a year since I attended the first ever Zooniverse Project Workshop in my role as an advisory board member. In April the second Zooniverse workshop will convene to discuss yet more exciting new projects. I’ll be there and hopefully so will Alice Sheppard (if her exam timetable permits!) This year, however, there is funding available for one more volunteer to attend. This is a responsible role for a dedicated and enthusiastic Zooite and that could be you! This is a fantastic opportunity to meet the science teams behind projects old and new and to find out just what is involved in getting a project up and running. You will attend some great presentations and have the chance to contribute to some fascinating discussions and workshops. Last year we covered things such as design, how to get the best science out of a project and how to create the best user experience. You need to be prepared to take part in discussions and to talk about your experiences as a Zooniverse volunteer. The more you put in the more rewarding the conference will be and you’ll find that your contribution will be hugely respected and valued. Volunteers can make or break a project and I was certainly made to feel that my input was extremely important. There is only one place available, however, so to help the team decide who gets to go please tell us in no more than 250 words a little about yourself, why you think you should go and what you can contribute to the discussions as a volunteer. Please add your full name and preferred e-mail address and send this to team@zooniverse.org with the subject line CHICAGO PLEASE. The closing date is 12 noon GMT on Thursday 7 March 2013. The Zooniverse team will choose the successful entry. 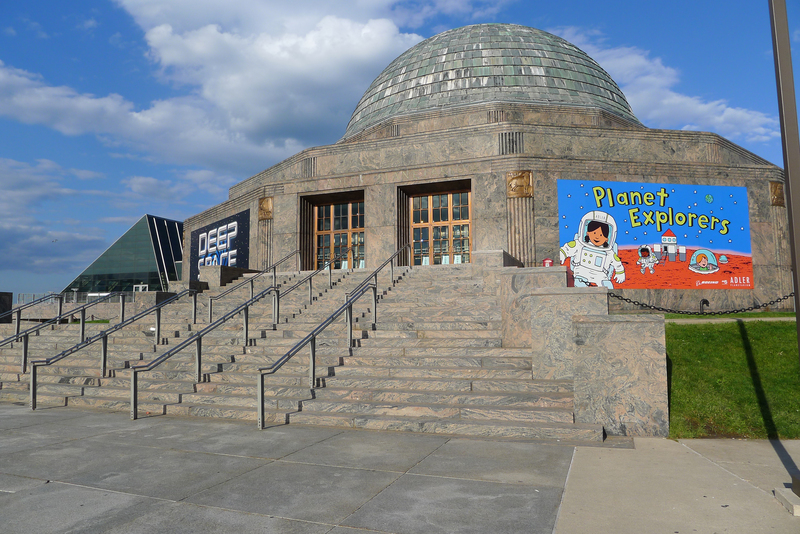 The conference will be held over two days at the Adler Planetarium, Chicago on 29 and 30 April 2013. Flight and hotel expenses will be reimbursed in full. This really is a fantastic opportunity to contribute to citizen science and the future of the Zooniverse – don’t miss out! For a detailed account of last years event have a look at the notes on my blog. Looks interesting, I will try and follow the conference on-line – You will have to give a presentation on it, at our meet-up in June, at Oxford. Instead, I plan to prepare a submission, which I will send to you, jules (copy team@zooniverse? ); if you find it interesting enough, I hope you'd be able to present at least part of it. Seems rather few zooites know about this; there's nothing on it in the Galaxy Zoo forum*, nor GZ Talk, the GZ blog, Planet Hunters (Talk or blog), Andromeda Project (ditto, though that's a retired project), … why not get the word out a bit, jules? The conference details have been shared and re-tweeted extensively on Facebook, Twitter and other social media. I also made a start on some of the forums and I see you have been helping out while I’ve been away. Thanks for that! Perhaps we could set a Talk link (or something) in http://www.zooniverse.org, for details on Zooniverse conferences. I think, that not everyone is informed about the workshop. : I was informed by a forum member about this blog post and then I also informed another zooite by PM. I think, that it actually would be better, that you invite your favourite volunteer to take part in that workshop and if s/he doesn’t want or can’t take part, you should ask the next one! I think, that there are e.g. GZ forum members, who are appropiate persons. Well, I know zooites, whom I would have invited! I could write 250 words, why they are appropiate persons, if I was asked to do! I would have maybe also invited Adam Stevens, who did a critical statement about the Zooninverse. Recently, ZK Chris wrote a related ZN blog post. : “Why the Zooniverse is easy to use” ! Has the gets-to-go-to-Chicago zooite been chosen yet? If so, when will it be announced who that is? I haven’t heard anything yet but I would imagine we’ll know fairly soon. “Well it looks like we’ll be discussing those things in person in Chicago next month! W00t! I got the email today, and am incredibly humbled and proud to be representing for PH once again. What started as a hobby quickly turned into what could possibly turn into somewhat of a career (through the study of citizen science and astrobiology as somewhat of a metascience), further strenghtening my previous point about PHs influence on science and education! So Hunters, I’d love to get the pulse of what you guys feel should be discussed at this conference! Feel free to write to me and chat about whatever your side-projects are (I know some hunters are interested in variables, galaxies, TTVs and such)! I’ll do my best to represent our project and the hunters’ perspective on this glorious quest that is ours! It is wonderful that katsee is so enthusiastic! On the other hand, this part is a bit of a worry: “proud to be representing for PH once again”. This isn’t a PH workshop is it? It’s a Zooniverse one, isn’t it? I’m so upset I didn’t see this earlier because I love the Zooniverse projects and live in Illinois! I don’t think there’s anything stopping you from attending, Anne L! It’s just that your travel expenses will be your own responsibility. I’m so upset I didn’t see this earlier! I love the Zooniverse projects and live in Illinois! That’s such a shame Anne – this is a conference that only invited delegates can register for. So, no opportunity *whatsoever* for ordinary zooites to ‘audit the classes’ (not sure if you have the same expression, over there in the UK)? Would it be possible for Katsee to reveal his/her identify, I know Jules & Alice(who are both going) both personally, obviously he/she won’t be signing, at the conference, as Katsee. I too find this very disappointing. I only heard about the workshop recently and mentioned to Jean Tate that I live just outside Chicago, thinking the event (conference, as Jules calls it) was open to the public. Jean evidently thought so too. She kindly suggested that I attend. If this is a roll-up-your-sleeves workshop that only invited delegates can attend why did you even bother to announce it? Do I misunderstand? Are you only referring to people who qualify for reimbursement of expense? Either way, the workshop policy is not clear. Sorry for the confusion; the meeting discussed here is primarily a meeting for Zooniverse developers and science teams – it is not open to the general public and most of the talks will be on technical details and planning for future projects. We’ve found it very useful to have representation from the volunteers there in the past (Jules did a great job last time), but can’t cater for large numbers of people. We are beginning to organise a set of more public events – the first is in Oxford and details are here – and thanks in part to the response to this thread we’ll be looking to organise a similar event in Chicago as soon as possible. Sorry for any confusion we’ve caused. Better late than never, but thanks for the clarification Chris. Something didn’t seem right about your characterization of the workshop (“primarily a meeting for Zooniverse developers and science teams“, “most of the talks will be on technical details and planning for future projects“), so I went and re-read jules’ notes from last year’s event. It was a strange experience, almost as if you two are talking about quite different events! In jules’ notes there’s material on Education, Communication, Motivation, etc; there’s not the slightest hint that it would be inappropriate for an enthusiastic (local) zooite to attend, as a ‘fly on the wall’ (in the talks at least); there’s much on ‘citizen scientists’, “the aim of the Zooniverse is to bring science to more people, engaging with citizen scientists, and so on. Public events are very welcome, and will surely be very well attended (if you get the communications right ;-)). However, you seem to be re-inforcing a most undesirable – and I’m sure quite unintended – message; namely, that only a few, chosen, zooites can participate in the ‘design and development’ part of Zooniverse projects; every other zooite just needs to wait for a public event, at which they can be told of what was decided elsewhere. Could the format of this Workshop accommodate submissions from zooites who are not among the chosen few? If I may, some further feedback. Mostly to jules, on the content of the blog post. This year, however, there is funding available for one more volunteer to attend. But it was just announced that two zooites are going (in addition to you, and, presumably, Alice)! The more you put in the more rewarding the conference will be and you’ll find that your contribution will be hugely respected and valued. Given that there are – obviously – many more than two or three dedicated and enthusiastic zooites, perhaps a few words on how the others can contribute (and have their contributions respected and valued) would have been a good idea? In light of Chris’ comment about thinking about planning for the Zooniverse to become more open, in the latest blog post Project Workshop Winners, I re-read jules’ notes fromlast year’s Zooniverse Project Workshop, with an eye to seeing what had been discussed then. Jules, would you mind digging through your memory banks and writing a few words on how ‘an open Zooniverse’ was covered in last year’s Workshop? That may well have been covered in some of the sessions I didn’t attend. It was a busy, packed workshop with several “un-conference” discussion sessions running concurrently. I attended those covering on-line communities, forums and social media (because those were the ones I suggested) and my choice is obviously reflected in the notes. Your notes record six (or seven) sessions, numbered 1 through 5, then 6/7: “Communication”, “Leader boards and badges – Motivation and Retention of volunteers”, “Clicks to Science”, “Use of Face Book etc and gamification”, “Project Health”, and “Sea Floor Explorer and Lens Zoo” (respectively; the last one is “6/7”). Do you happen to recall how many other discussion sessions there were (roughly)? It’s clear, from your excellent notes, that the two days were very busy. If this year’s Workshop is anything like last year’s, Katy and Janet can expect to be both exhilarated and exhausted by the end of Day 2!